Kichijoji, another center of Tokyo trends, selected as the most-like-to-live town in the Tokyo area. Shopping areas in Tokyo, often suggested in guidebooks are towns in central Tokyo, such as Harajuku and Ginza. However, Kichijoji just outside of central Tokyo also the attract people looking for cool items. They also don't miss dining at fancy restaurants and Izakaya bars there. The towns called Nakano 中野 Koenji 高円寺, Shimo-kitazawa 下北沢, and Kichijoji 吉祥寺 in the west of central Tokyo are popular among young people. It seems Kichijoji is the most popular among the all and the town has been selected as the most-like-to-live town in the Tokyo area over years. - Kichijoji Shopping Area has hundreds of fashion stores along shopping streets and alleys, handling cool & rare items. Major Japanese department stores are also located in this area. Large department stores are also in the building of Kichijoji station. - Kichijoji Shopping Area has many fancy cafes which include fast-food and confectionery shops. Top brand confectionery shops in Europe have opened in Kichijoji. 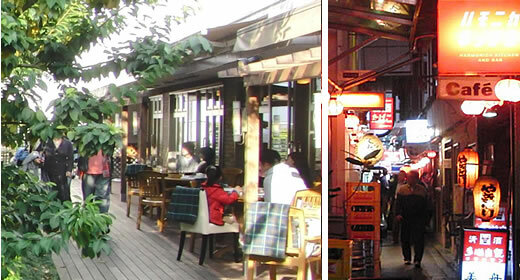 - Kichijoji Shopping Area has various types of cozy restaurants, from upscale to casual ones. Since quite a few of non-Japanese residents live in Kichijoji, there are many restaurants offering international cuisines as well as Japanese food. - Kichijoji Shopping Area has nostalgic Izakaya dining bars square called Hamonika Yokocho. In Hamonika Yokocho, there are small dining bars offering local foods and drinks at reasonable price. The nostalgic atmosphere at the allay attracts both young and old people. 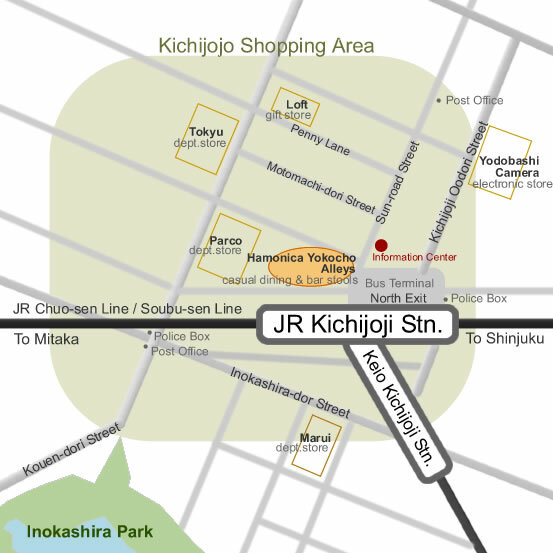 The street map below is the Kichijoji's shopping area map. If you don't know where to start walking around the area, it is suggested visiting the Information Center (Machi Annai-jo in Japanese). If you go out the North Exit of Kichijoji station and walk toward the street “Sun-road” several ten meters, you will see the office on your right in the street. Thankfully, there’s also a currency exchange office nearby. It is within easy access to Kichijoji from Shinjuku and Shibuya. 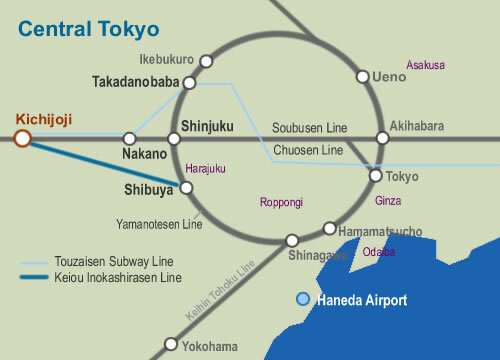 It takes only 14 minuets from Shinjuku by JR Chuo-sen line, or 19 minutes by the Sobu-sen train. It is a 16- min ride from Shibuya to Kichijouji by train on the Keio Inokashira-sen line (by Kyuko Express Train).